I think I’d be much more productive if I started every morning off with this colorful breakfast salad. Topped with a poached egg and drizzled with a honey–crème fraîche dressing, this is breakfast at its finest. So we’ve been post-solar eclipse now for about a day and I’m still regretting not hopping in the car and driving just 3 hours to see the solar wonder. It was so cloudy here that every 5 minutes we could see a little shadow of the waning sun reflected through my co-workers make-shift viewing box. Although it was pretty neat to see the reflection, I know it doesn’t compare to the full experience. As it was making its way across the nation, I was living vicariously through various live streams from New York Times, Washington Post, and CBS. In my dismay, I started researching when the next total eclipse would occur. And although it won’t be making a trip across the continental US any time soon, I can still experience a solar eclipse within the next few years. I feel like that’s a good compromise. So the good news is that we only have to wait until July 2019 to see another total solar eclipse. But I think I’m going to wait until 2024. It just so happens that a total solar eclipse is happening smack dab on my birthday in 2024. And the best part, it’s traveling through Mexico. Coincidence? I think not. It’s a sign from the universe that I’m meant to visit Mexico at least once in my life. How cool would that be?! Otherwise, if I can’t make it across the border I can still see it in Texas, Ohio, Missouri, New York, Arkansas…ooh! And Canada! I just saw that (yes, I know that requires crossing a border). Hmm that might just have to be a birthday-eclipse-vacation, don’t you think? Anyway, enough about my vacation in 7 years. This breakfast salad is so satisfying, so healthy, and so fresh. It’s gorgeous and colorful, full of texture and flavor, and is super easy to throw together. If you’ve never used crème fraîche in a salad dressing, well then you’re in for a treat. It adds a subtle cheesy-creaminess without muddying the flavors from the honey or chives. Choose the ripest peach and avocado you can find for best flavor, and if you aren’t a fan of Swiss chard with its earthy, beet-like flavor, opt for something a bit milder but still full-flavored like arugula, or kale. And lastly, if a poached egg isn’t your style, throw a fried egg or two on top of the salad instead. This breakfast is super versatile and can be adapted for preference or season. Hmmm maybe we’ll need a fall breakfast salad too? Whisk together crème fraîche, vinegar, oil, chives, and honey; season with salt and pepper. To poach the eggs, bring a large pot of water to a boil. Meanwhile, crack eggs into a colander, let drain 30 seconds, then gently transfer to a 4-cup liquid measuring cup.Stir vinegar and salt into boiling water. Remove from heat, then gently lower liquid measuring cup to just above the water and carefully drop eggs into water one at a time, rotating 90-degrees after each addition. Cover pot and let eggs cook 3 minutes until whites are set. If they are not set after 3 minutes, return lid to pot and cook 30 seconds more. Gently remove each egg with a slotted spoon, allowing water to drain off then transfer to a plate. Divide Swiss chard among two bowls, then divide and arrange tomatoes, avocado, peach, and corn in each bowl. Top each salad with 1 or 2 eggs, and season with salt and cracked black pepper. Garnish with fresh chopped chives, basil, and microgreens. Drizzle salads with dressing and serve with toasted baguette. Depending on preference, serve 1–2 poached eggs per salad. For best poached eggs, be sure to use very fresh eggs. **If you like bitter, earthy greens, include the stems of the Swiss chard. They add an earthy, beet-like flavor. If you aren’t a fan of beets or want something a bit less bold choose peppery arugula or baby kale. I’ve never had salad for breakfast and that’s going to change with recipe – YUM!! Love the creme fraiche dressing! 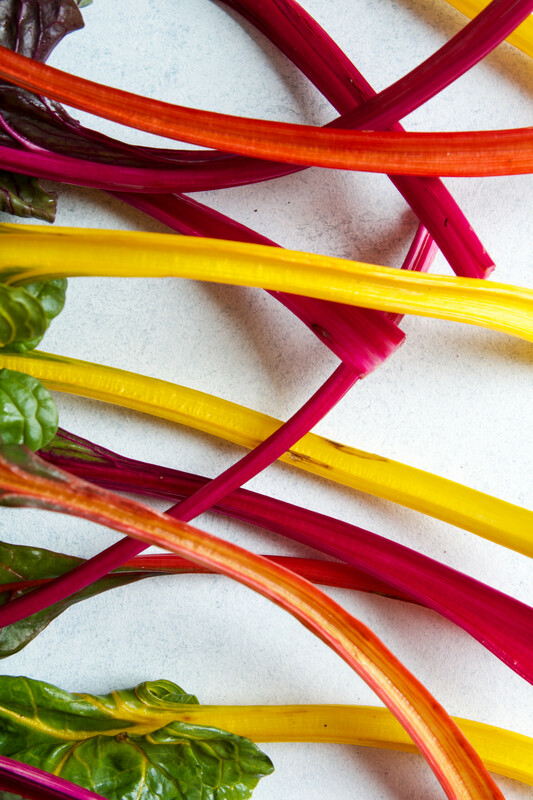 Gorgeous rainbow chard! Very nutrious breakfast. I hope you make it Mexico. It is a lovely country with warm friendly people. Salad for breakfast? That’s an idea I’ve never even considered before lol I guess I’ll have to try it! It’s a bit different! Great way to start the day off on a healthy foot!